UPDATE 1100 GMT: Saudi Arabia’s navy has evacuated 86 Arab and Western diplomats from the port city of Aden in southern Yemen, as the forces of the Houthi movement continue to advance despite Saudi airstrikes. Aden is Yemen’s second largest city and had been the provisional headquarters of President Abdu Rabbu Mansour Hadi, before he left for Egypt on Thursday. Residents of Aden said on Friday that fighting had broken out in pockets around the city, with Houthi-allied units advancing and forces linked to Hadi switching sides or deserting. Looters pillaged as local militias armed themselves to defend their neighborhoods or fight the Houthis. Commercial flights to Yemen have been halted, and the Saudi-led coalition has blockaded the ports. Saudi Arabia has carried out airstrikes for the third night in its assault on Yemen’s Houthi movement, which controls the capital Sanaa, and its allies. Targets included the city of Hudaydah on the Red Sea Coast, the Houthi base of Saada in the north, and military installations in and around Sanaa. The Saudis also attacked the base of former President Ali Abdullah Saleh, who has allied with the Houthis. Saleh, who ruled the country for more than 30 years before his fall in February 2012, is believed to have fled to Sanhan near the capital. Ground fighting has been reported in the southern port city of Aden between Houthis, a Shia Muslim movement, and forces loyal to President Abdrabuh Mansour Hadi. Hadi, who succeeded Saleh in a transitional agreement in 2012, fled to Aden last month and tried to set up an alternative Government. He left Aden on Thursday, arriving in Egypt via Saudi Arabia to participate in an Arab summit. A US defence official said American forces rescued two Saudi airmen on Thursday after they ejected from their F-15 fighter jet over the Gulf of Aden. The official said the rescue took place at Saudi Arabia’s request, while a White House statement said that Saudi Arabia’s King Salman thanked President Obama in a phone call. The Saudi State news agency said the F-15 had been “stricken by a technical fault”. Journalists said the situation in Sanaa is worsening, with food shortages and closure of banks since Thursday. Power supplies have not been cut, but hospitals are struggling with casualties and appealing for donations of blood. 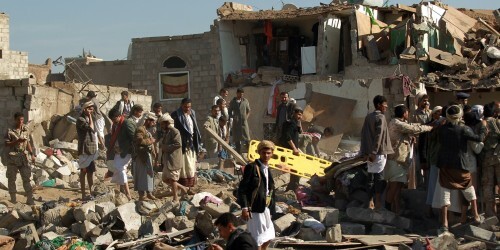 The Houthi-run Health Ministry said 39 civilians have been killed by the air attacks.